We manufacture, supply and export a gamut range of Construction Chemicals that is available in all the possible varieties for filling the cracks, floors and constructions etc. These are widely used in various industrial applications. Moreover our white cement is popular in easy and fast application. Our range of construction chemicals includes Anti Corrosive Coating, Concrete Floor Dust Proofer, Floor Hardening Compound, Compensating Grout, Flexible Sealant, Grouting Compound and Water Stopper etc. We manufacture non metallic floor hardener for concrete floors application. Perma Floor Top QZ is a floor hardening compound based on non metallic aggregates a blend of ordinary portland cements and activating chemicals. Perma Floor Top QZ is for use on green concrete of industrial floors to achieve high abrasion and impact resistance properties on the finished floors. Perma Floor Top QZ is based on non metallic quartz aggregates. Perma Floor Top QZ treated floors are ideal for places where chemical spillages are expected, and where metallic aggregates are not desired. Perma Floor Top QZ is used in concreting of floors for laboratories, chemical factories, breweries, shopping centers, super markets etc. Perma Floor Top QZ product are designed for high abrasion and impact resistance properties to the concrete floors. After floor concreting when the concrete is firm to take the weight of workman sprinkle Perma Floor Top QZ at the desired rate on the green concrete and trowel it in with metal floats or power trowel. Care should be taken to see that concrete surface is just ready to receive dry shake powder. If delayed too much it will become unworkable and if Perma Floor Top QZ is sprinkled too early it will get mixed with the concrete and loose its utility. Sprinkling of Floor Top should be controlled such that an uniform quantity of the product is sprinkled throughout. It may be suggested that broadcasting of Perma Floor Top QZ be done in two stages. The second stage of broadcasting done in a perpendicular direction to the first stage broad cast. We provide Waterproof Elastomeric Coating to our valuable clients which are made of high quality material. These coatings help the exterior walls of building from patches caused due to fungus and algae. Our coating prevents the walls from absorbency of water and destroying the shine of the paint. These are available as per the specifications mentioned by clients. We export and supply these waterproof coatings at affordable rates. Ordinary exterior emulsions cannot protect external walls from patches of dampness algae and fungus caused by rain. These emulsions cannot protect the walls from atmospheric carbonation which causes dark patches on the surface and its penetration inside causes corrosion of steel. 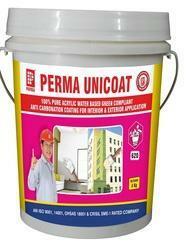 Perma Unicoat is specially formulated to give long lasting protection and beautiful looks. This Compensating Grout is available in gray powder which is added to water for smooth paste. These products are used for fitting the machine foundation, pipes pass through walls, base plates and crane rail. These grouting materials are very high strength in application for installation of dowel bars and anchor bolts. 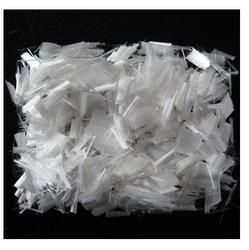 It consists of chemical resistance properties. We also offer these as per the customized requirements of clients. Grouting structural cut outs and recesses in sanitary fittings like floor traps, annular spaces of pipe passes through walls etc, in residential buildings. Grouting crane rails, anchor bolts, dowel bars etc. Perma Grout- 40 achieves the strength of parent concrete within 72 hours i.e. 200 kg s/ cm. Perma Grout- 40 is shrinkage compensating hence least affected by shrinkage. 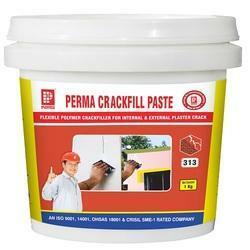 Perma Grout- 40 is free flowing and self leveling hence dose not require any vibrations. Perma Grout- 40 is free from any added Chlorides, Sulphates, Nitrates and any ferrous materials. Clean the foundation surface to be grouted so that it is free from dust,dirt, oil, grease,curing compound, paint etc. Make the surface wet and avoid stagnation of water in the recesses. . Mix Perma Grout- 40 with water as per the ratios mentioned above in the properties,to form a smooth consistence mortar or slurry. Lower the water content higher is the strength. Pour the material in the pocket or recesses to be grouted and cure by placing a wet hessian after the initial hardening. All "PERMA" branded products are manufactured under strict quality control supervision Jasper exact manufacturing specifications. Should you find the behavior of the product varying from the claims in the data sheets please stop the use of the product and contact the nearest Perma staff or distributor. Plaster Putty is offered to clients and is used for exterior plastering of walls. These coatings help the exterior walls of building from various climatic conditions. Our plastering prevents the walls from destroying the shine of the painting. It is easy for application for direct brick work also. These are available as per the specifications mentioned by clients. We export and supply these plastering at affordable rates. 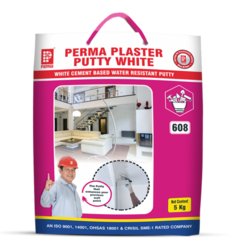 Perma PU Sealant- White is a highly flexible and durable Polyurethane Sealant which is ideal for sealing joints in internal as well as external surfaces of the building. 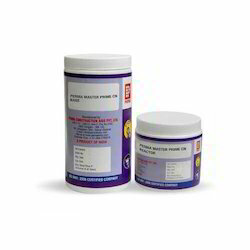 Perma PU Sealant- White has good adhesion to a variety of building materials and surfaces. Perma PU Sealant- White is used in expansion joints internally and externally. It is ideal for use at the junction of precast elements of the building. It is used for sealing joints between dissimilar materials such as metal, wood concrete etc. The edges of the joint to be sealed must be clean and should not contain any oil, grease, dust dirt or moisture. Fill the sealant along the joint to be sealed taking care not to form any air pockets, and thereafter tool the joint to a smooth surface with a suitable spatula. A bond breaking taps need to be used to ensure that the sealant does not contact the bottom of the joint. The joint width to depth ratio may be maintained at 1:1 up the 15mm width and thereafter joint width to depth ratio could be 2:1. Clean the equipment and tools immediately after use when the sealant is still wet with ethyl acetate or a suitable solvent.Upon drying it can only be cleaned by mechanical means. One 600 ml sausage will cover a 6mm X 6mm joint length of about 17 meters. Perma PU Sealant – White is available in 600 ml sausages. 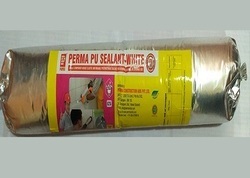 Perma PU Sealant – White has a shelf life of 12 months from the date of manufacture. Our Mould Releasing Agent is provided utilizing premium grade material and sophisticated technology. These are used to provide stain less concrete surface. These are highly demanded and are availed at affordable costs. It is very accurate in easy mold cleaning which is suitable for all types of shutters and molds. Perma MRA is suitable for all types of shutters and moulds. 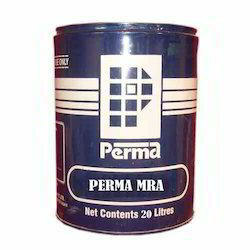 Perma MRA can be applied to steel, timbrel, plywood, plastic and rubber moulds also. Perma MRA gives very good shutter releasing properties. Other oils used in similar application penetrate into the concrete and interfere with the strength of the member. Apart from this they leave ugly stains on the concrete surface. Before subsequent finishes one needs to chemically or mechanically remove these stains and left overs of these oils. Perma MRA is designed keeping all these problems in mind and to the concrete. Application of conventional mould releasing oils is tedious and time consuming. Perrna MRA can be sprayed saving time and labor. When using for the first time spray Perma MRA on the shutters while erecting them, and then just before concreting. There after Perma MRA can be sprayed just after shuttering and cleaning. During initial uses new commercial ply shutters tend to be absorptive. Hence it is necessary that new ply shutters are sprayed just before concreting also. Perma MRA reacts chemically with cement in such a manner that excellent release properties are imparted to the treated face of the shutters and moulds. Concrete caste with Perma MRA on the shutters has smooth, hard uniform and light coloured finish. The adhesion of subsequent finishes such as renders, paints or textured coating is unaffected by use of Perma MRA. We manufacture and exporters of good quality of Grouting Compound and it used for farious grouting application. 1 Grouting heavy machine foundations which are subjected to huge dynamic loads. 2 Grouting underneath base plates of machines. 3 Grouting of columns / stanchion foundations. 4 Grouting of crane rails, anchor bolts, dowel bars etc. 1 High early and ultimate strength: Perma Grout-60 White achieves a compressive strength of over 300 kg/cm2in 24 hours and strengths in excess of 600 kg/cm2 in 28 days. 2 Non shrink and Expansion: Perma Grout-60 White is expansive. it exhibits an expansion of about 4% in plastic state and 0.2% in hardened state. Hence the chances of shrinkage of grouting material do not arise. 3 Free flowing and self Levelling: Perma Grout-60 White is free flowing and self levelling: It occupies voids and recesses without the need of any tamping or vibration. The product can also be pumped. 4 Safety in use: Perma Grout-60 White is free from any added chlorides, sulphates, nitrates and any ferrous materials. 1 Clean the foundation surfaces to be grouted so that they are free from dust, dirt, oil, grease, curing compound, paint etc. 2 Make the surface wet and avoid stagnation of water in the recesses. 3 Mix Perma Grout-60 White with water as per the ratios mentioned with properties above to form a smooth consistency mortar or slurry. Lower the water content higher will be the strength. 4 Pour Perma Grout-60 White mortar or slurry in the pocket or recess to be grouted. After initial hardening cure by placing wet hessian over it. 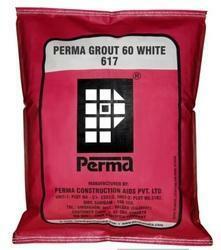 Packaging Details: Perma Grout-60 White is available in 10 kg, 25 kg and 50 kg lined HDPE sack. With the help of our expert professional we are manufacturing a high grade Tropic Polyester Grout. These products are used for fitting the support bolts, base plates and rail tracks. These grouting materials are very strength in application for installation of dowel bars. It consists of chemical resistance properties. We also offer these as per the customized requirements of clients. Perma Anchor Fix – 80 is a polyester resin based grout which is used in locations where very high early and ultimate strengths are required along with chemical resistance properties. The Product is supplied in pre measured two component units. Anchor Fix – 80 is used for installation of dowel bars in concrete and for providing starter bars in RCC structures for continuation structural concrete or in extension of structural members. Anchor Fix-80 can be used for fixing foundation bolts, base plates and rail tracks. Because of its thixotropic nature the product is successfully used in vertical horizontal as well as in over-head applications. Clean the holes to be grouted with compressed air so that the holes are free from any loose ground material, which could affect the bond of the surface with the grout. 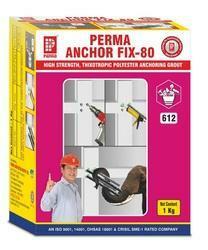 Mix the two components of Anchor Fix – 80 thoroughly to obtain an uniform consistency smooth paste. Fill the hole with this paste taking care to see that the hole is filled effectively from the bottom to avoid any entrapped air in the hole. Insert the dowel rod, anchor or bolt in the filled hole and hold it in position till it has become firm. Tool the mouth of the hole to make an even and smooth surface. Perma Grout – 40 is a free flowing shrinkage compensating grout mix supplied in grey powder form which needs only on site addition of water to form a ready to use grouting slurry. It is used for Foundation Grouting. It is used by various perpose in Construction Industry. Grouting structural cut outs and recesses in sanitary fittings like floor taps, annular spaces of pipe passes through walls etc. in residential buildings. Perma Grout – 40 acheives the strength of parent concrete within 72 hours i.e. 200 kgs/cm2. Perma Grout – 40 is free flowing and self leveling hence does not require any vibrations. Perma Grout – 40 is free from any added Chlorides, Sulphates, Nitrates and any ferrous materials. Clean the foundation surface to be grouted so that it is free from dust, dirt, oil, grease, curing compound, paint etc. Make the surface wet and avoid stagnation of water in the recesses. Mix Perma Grout – 40 with water as per the ratios mentioned above in the properties, to form a smooth consistence mortar or slurry. Lower the water content higher is the strength. 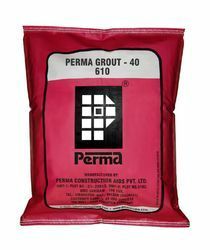 Perma Grout – 40 is available in 10 kg, 25 kg and 50 kg sack. Perma Grout -40 has a shelf life of 12 months if stored in original packing and kept away from moisture in a cool and dry place. Perma Floor Top is a floor hardening compound based on non-oxidising metallic or non metallic aggregates a blend of ordinary Portland cements and activating chemicals. Perma Floor Top is for use on green concrete of industrial floors to achieve high abrasion and impact resistance properties on the finished floors. Depending upon the selection of aggregates Perma Floor top is available in two grades. Curing should be carried out immediately after final trowelling has been completed. Perma Floor Top QZ is available in Dark Grey, Red, Blue, Leafy Green, Olive Green, Green ,Terracotta and Terracotta Brown. Floor being a very important utility member of any industrial or commercial unit sufficient care needs to be taken while designing and execution. The following precautions however need to be taken while concreting a floor. Perma Floor Top QZ available in 25 kg & 50 kg sack. Perma Floor Top QZ has a shelf life of 12 Months from the date of manufacture, if stored in dry and cool conditions. Anti Corrosive Coating is widely appreciated across the world for high quality and effectiveness. Our coating is applied for ferrous and non ferrous metals for corrosion resistance in all weather conditions. These are manufactured from standard quality material that is procured from the reliable vendors and are properly tested by our quality controllers. They are made by usage of latest techniques which are resistant to heat and non toxic. These are highly demanded and are availed at affordable costs. Porosity of concrete surfaces, moisture and the alkalinity of the concrete surface make sit difficult for the epoxy products to bind with the concrete bases effectively. To get over these problems an effective epoxy primers made use of. MASTER PRIME-CN is a two component product based on non solvent epoxy base and epoxy hardener. To bind epoxy mortar sand flooring products to the concrete base taking care of the porosity of the base and mobilizing the particles of the mortar sin to the crevice sand hole sin the base. MASTER PRIME-CN is applied on a dry concrete surface which is at least 28 days old before laying epoxy flooring materials or coatings. products effectively on the concrete surfaces and makes it easier for epoxy products to bind with the concrete effectively. to the surfaces to make them bone dry. Areas on ably dry surface is good enough. Surface to be primed with Master Prime-CN should be free from dust, dirt, oil, grease, loose particles and excessive moisture. Our valued clients can avail a Micro Reinforcement Fibers which are exported and supplied in different quantity packaging. It is applicable for plastering the walls for covering the crack. This is also used as plastering for interior and exterior the walls for scratch free. We manufacture them with the standard quality material that is smooth and high strength in nature. They are offered to our valuable clients at competitive prices as per standard norms. RE. CON FIBRES are precision cut polypropylene fibres in two sizes of 6 mm and 12mm which are used in plaster sand in floor screeds to produce crack free and durable wall plasters, concrete panels and durable floor screeds. Re-Con Fibres are used as an additive in mortars for making crack free Internal and external plasters of buildings. Re-Con Fibres are also used as an admixture in floor screed concrete for making crack free and aberration resisting floors. As a secondary reinforcement,in large bays of concrete to get over surface cracks. Re-Con Fibres when mixed in mortar or screed concrete disperse themselves Immediately and uniformly to act as reinforcements which do not allow the hardened plasters and floor screeds to crack. In mortar mixes add 125 gms of 6 mm Re-Con Fibres per bag of 50 kg cement for achieving a crack free internal and external plasters. In floors screed add 125 gms of 12mm Re-Con Fibres per 50 kg bag of cement for achieving a crack free and aberration resisting floors. Re-Con Fibres make the plasters and screeds crack free. Re-Con Fibres improves the compressive,tensile and flexural strengths of mortars and screed concretes. When used in floor screed Re-Con Fibres increases the abrasive strength and hence long life of the industrial floors. Re-Con Fibres are non corrosive hence long life of plasters and screeds. All "PERMA" branded products are manufactured under strict quality control supervision as per exact manufacturing specifications. Should you find the behavior of the product varying from the claims in the data sheets please stop the use of the product and contact the nearest Parma staff or distributor. We have a wide range of Flexible Sealant which is made of premium quality raw material. These are highly used to fill the gaps in internal and external applications. Our sealing material is effective in all weather conditions and high in strength. These are tested on different parameters to satisfy the needs of clients perfectly. We offer these sealing materials are available at affordable prices. Perma Acri-Seal is an acrylic sealant available in brilliant white colour for sealing gaps around window and door frames. Styrofoam board, particle board panels etc. It can also be used for sealing fine moving cracks at the junctions of column/ beam and brickwork and for sealing general cracks in plasters prior to painting. Can be used to seal the annular spaces in collar joints of sanitary plumbing and to seal the junction of pipe and the sleeve in the pressure pipe joints. To seal all joints in Cl, Gland PVC tubes. Formulated for Indian weather conditions. Ideal for both internal as well as external application. Can be over coated with emulsion or enamel paints. Does not need priming. Wetting the surface is enough. Service temperature -20 to +80 °C. Water based, hence environmentally safe and nontoxic. Take sealant paste and apply in to the wet base of the joint so that it completely fills the joint. Tool the surface immediately after sealant application to provide a smooth even finish. 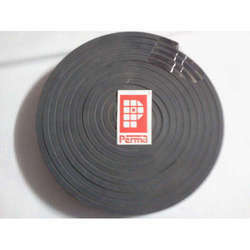 150 gms of Perma Acri-Seal shall seal a length of 15 sq-ft of 6 mm wide gap. Twenty four months from the date of manufacturer. Should you find the behavior of the product different from the normal feel or the claims with the literature, stop the use of the product, cordon off all such product and inform Perma with a complaint letter stating the problem, batch number etc. If the product is used in spite of observed variance the responsibility shall be with the user. Enriched by our rich industry experience we are offering Water Stopper which is manufactured with premium quality materials that is procured from certified vendors. These stoppers are effective in application for prevention of leakage of water. They are highly used in heavy construction joints as they are reliable in strength and efficient in blocking the leakages. These are easy to use and install. Conventional Pre formed water bars have not been user friendly and often failed because it hindered the concreting because of its bulks size in the shutters and the nailing of the water bars to the shutters to keep them in position, punctured the water bars and made them ineffective. Keeping this in view perma introduces user friendly and most effective water bars for construction joints which as well in the centre of the construction joint post construction under pressure when it comes in contact with water from leakages, effectively blocking the leakages. Perma Hydroswell is a neoprene based hydrophilic construction joint water bar which expands to 250% of its original volume in the construction joint when it comes in contact with water post construction. Perma Recon Fibres are used as additive in mortars for making crack free internal and external plasters of buildings. Re-Con Fibers are also used as an admixture in floor screed concrete for making crack free and abrasion resisting floors, as a secondary reinforcement in large bays of concrete to get over surface cracks. In mortar mixes add 125 gms of 6mm Re-Con Fibers per bag of 50 kg cement for achieving a crack free internal and external plasters. In floors screed add 125gms of 12mm Re-Con Fibers per 50 kg bag of cement for achieving a crack free and abrusion resisting floors. The above dosage mentioned are maximum. The minimum dosages recommended is 100 gms to a bag of cement. Perma Recon Fibres make the plasters and screeds crack free. Perma Recon Fibres improves the compressive, tensile, and flexural strengths of mortars and screed concrete. When used in floor screed Perma Recon Fibres increases the abrasive strength and hence long life of the industrial floors. Perma Recon Fibres are non-corrosive hence long life of plasters and screeds. 100 to 125 gms per 50 kg bag of cement. 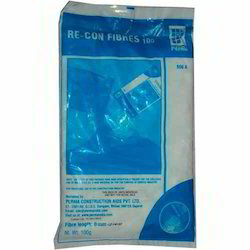 Perma Recon Fibres available in 125 gms and 10 kg bulk pack. Perma Recon Fibres has a shelf life of 24 Months from the date of packing.